The 2015 Missouri Assessment Program (MAP) scores are in for Missouri school districts. We are told by the Post-Dispatch that the English and math tests were different this year, based on Common Core expectations. Thus, you can’t compare the numbers to those of previous years. But we can compare schools to each other, and I will do that here. You can look up scores by district and by school. 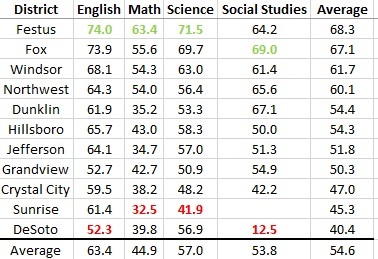 Here’s how Jefferson County schools fared, sorted by overall average. The numbers denote the percentage of students that passed each subject test in each district (for example, 74% of Festus students passed the English test). The best scores for each subject are in green bold, the worst are in red bold. I calculated the averages for each subject at the bottom of the table. 2014 JeffCo results are here and 2013 results are here. As you can see, Festus did the best, as one might expect, given the district’s results on other recent assessments. Festus had the 10th best math score in the St. Louis region. It is perhaps a bit surprising that Fox came in second, given all the turmoil there recently. It will be interesting to see next year’s scores for Fox, what with the new superintendent and the big wave of teacher and admin retirements at the end of the last school year, courtesy of the buyout program. Windsor had the 3rd best average. At the bottom of the list were Grandview, Crystal City, Sunrise (which has no high school) and DeSoto. It is a bit surprising to see Crystal City so low on the list, given its recent performance. Grandview has been all over the map in the past couple of years. DeSoto has consistently been pretty low. According to the P-D, “This school year, children will be tested again on Common Core standards. But legislative action is forcing the state to change the tests in 2016 and 2017.” The paper also says that annual performance report (APR) scores will come out in October. I will report on those as well and compare them to previous years’ results. How did St. Pius X rate? As a private school, I don’t think they take these tests.